JEDDAH, 25 October 2004 — The Guinness World Records has recognized Dr. Muhammad Karim Beebani’s miniature Qur’an as the world’s smallest. “The world’s prestigious institution of world records has recognized my entry and am awaiting a formal certificate to this effect,” Dr. Beebani told Arab News on Saturday. He expects the certificate to reach him in a fortnight. “Yesterday, I found my entry accepted by the records section of the London-based institution,” he said. “Congratulations. Your record has been approved as an official Guinness World Record. You’ll receive your complimentary Guinness World Records certificate shortly,” Guinness stated. A week ago the Guinness informed on its website that the initial investigators did not find any flaw in the evidences demanded by the Guinness and the matter was handed over to the official keeper of the records, Stewart A. Newport, the signing authority for any proven record. Printed in Cairo in 1292 H (1875), the 571-page Qur’an measures 1.7 cm long, 1.28 cm wide and 0.72 cm thick. Each page has 18 lines. The name of the calligrapher written on the opening page is Ali Usman. “I bought it through a collector friend in London,” Dr. Beebani said, adding that it is printed in the obsolete Maghrabi font style with its pages numbered both in Arabic and English. Dr. Beebani, a Pakistani physician who is a resident of the Kingdom for 32 years and is associated with King Abdul Aziz University for the last six years, acquired the miniature Qur’an from the UK last year. “I sent my claim to the Guinness because I was convinced that it was the smallest known,” said Dr. Beebani. The one he submitted to the Guinness has turned out to be the smallest of all. He also has many other copies of handwritten and rare Qur’an editions. 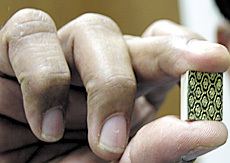 Until Dr. Beebani’s claim, the Guinness Book recorded 572-page miniature Qur’an owned by Narendra and Neera Bhatia of Faridabad, India, as the smallest. “In fact, a museum in China is known to have a miniature Qur’an smaller than that was recorded in the Guinness Records but larger than my entry,” said Dr. Beebani, whose late father Fazal Karim was also a collector of Islamic objects.